Happy New Year! Hope that your January is off to a good start. As we head into 2018, I thought it would be beneficial to know where the health of San Francisco’s real estate market is. As our new neighborhood is becoming more vibrant with grocery stores, cafes and restaurants all within walking distance, more people want to live here! Affordability is a main concern for home buyers, but overall, the real estate market remains in favor of sellers. Below, Pacific Union offers our perspective on some key U.S. economic and housing market trends that we believe will play out in the coming year. Mortgage interest rates are still low, but will keep rising. 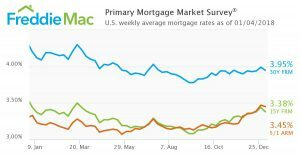 Mortgage interest rates will continue their slow, gradual increase, but are being held down by low inflation and low overseas central banks’ interest rates. We would have to see much higher inflation than has been the case to notably increase mortgage rates. New construction would have to ramp up considerably, or some combination of higher mortgage rates and an economic downturn would have to dampen buyer demand to tip the market. Neither event appears to be in sight for 2018. However, most of the recent new construction has been geared toward higher-end buyers, meaning starting pricing for a new condo in South Beach is between $1,300-$1,500 sq.ft. (Believe it or not, for 94105 being the most expensive zip code in San Franicsco at $1,200/sq. ft., it is indeed a better value for South Beach buyers when it comes to purchasing options.) Plus, many homeowners who bought when mortgage rates were lower will not be inclined to sell. These factors leave huge gaps in inventory, meaning homeowners that take this opportunity to sell can name their price. Millennial first-time buyers impacted the market in 2017, and they will be increasingly active over the next few years. High-wage earners in San Francisco are also realizing that they would rather spend most of their income on their own mortgage rather than on monthly rent. From an economic standpoint, there does not appear to be any obvious excesses that could destabilize markets, and risks are balanced. Furthermore, the global economy is doing well, and the financial system is on firm footing. The House Republicans’ tax reform could be very detrimental to housing markets across the country, especially ones where buyers are already constrained by affordability and a lack of homes on the market. The reform further disincentives existing homeowners to sell, especially if they lose the grandfathered tax deductions when buying again. Some buyers will certainly be discouraged by tax changes.